Prime: The New Space Race: The Quest For Venture Capital For Small Satellite Technologies, by William F. Vartorella, Ph.D., C.B.C. of Craig and Vartorella International, Inc.
Is another Sputnik Moment on the horizon? Can the privatization of spaceflight become self-sustaining? And profitable? These are underlying, unstated questions being ruminated by venture capitalists (VCs) poised to enter the next space race. The growth arena is hybrid communications across multiple, cost-effective platforms. On-demand content delivery is the mantra. Futurists proclaim that the era of personal satellites is just over the horizon. And for good reason. Your smart-phone. It has voice, data, camera, GPS, celestial navigation, solar, aurora, and scores of apps monitoring weather, glaciations, sea temperatures, real-time location of endangered specieswhatever your interest and its affordable. Add solar panels and you essentially have a small, hand-held satellite platform ready for innovationand funding. Prime: A Market Forecast For High-Frequency, Space-Qualified, TWTs, by Deepak Gupta, Ph.D., MEng, DIS, CEng, FIET, Black Kite, Ltd.
Satellite communications use various frequency bands, ranging from L-band (approximately 1 GHz to 2 GHz) to Ka-band (approximately 26 to 40 GHz). Travelling wave tubes (TWTs) are specialized and essential components for SATCOMs and are required in both the space and ground segments to create an end-to-end communications chain. The TWT market is dominated by two world players, L-3 Communications in the U.S. and Thales Electron Devices in Europe, who together hold nearly 90 percent of market share, mainly in the lucrative Ku-and Ka-bands. Growing pressures for faster and higher quality communication services are driving the need to find more bandwidth to serve the increasingly hungry data and broadcast applications (e.g., interactive gaming, HDTV). To satisfy this insatiable demand, higher frequencies are being considered, which necessitates the development of TWTs operating at higher frequencies, namely Q & V bands. Indian TV viewers and Internet surfers never had it so good. Seven DTH operators, 500 plus TV channels, MSOs and cable ops who are upgrading the ageing analogue infrastructure, broadband serviceshave all given them a slew of choices. And all of this is becoming possible thanks to satellite communications and broadcast services being offered by satellite operators. This is a really exciting but challenging time in the satellite industry, especially in the media and broadcast sector. Those who know me personally already know that I dont actually know all that much, but what I really do know are lots of smart people in lots of important places, so Ive called on a number of my friends to offer insights. Most arent in a position to publically comment without their employers dropping a ton of bricks on their desks, so Ill just simply call them Programmers Anonymous. If I share the secret handshake they will cut off my fingers, so dont ask who Ive consulted with! Satellite facilities requiring multi-channel, multi-transponder, and multi-satellite downlink signal reception, monitoring and L-band distribution include CATV and IPTV headends, DTH broadcast centers, certain government agencies and communications ministries, teleports, and even satellite TT&C (telemetry, tracking & control) sites that need to monitor large numbers of signals. The Etisalat super headend case is an excellent example of the kind of modern L-band distribution solution that makes business sense to deploy today in large scale downlink operations. 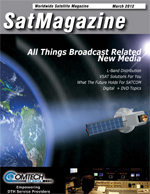 SatBroadcasting: DVB-RCS2, A Most Worthy Upgrade, by Richard R. Forberg, Vice President, Product Management, STM Group, Inc. The industry leading DVB-RCS standard recently underwent a thorough upgrade, bringing the potential of satellite communications as a whole to a new level. The new DVB-RCS2 standard (RCS2) not only improves link efficiencies, it also rockets throughput potential up by 300 percent. Implementing VSAT solutions for large-scale narrowband networks is a key area of growth for satellite service providers, particularly within the utility market. In the utility industry, operators need narrowband connectivity to support SCADA monitoring at remote substations. Narrowband is also essential for enabling the smart grid and backhauling smart meter data across thousands of rural collection points. Additionally, as utility companies evolve, they need dedicated satellite bandwidth for new, diverse applications such as Internet, video, and VoIP. Errol Olivier is a leading executive with more than 25 years experience serving the oil & gas services and telecommunications industry. He brings his vast technical, operational and sales management expertise to his role as President and CEO at MTN where he is responsible for all daily operations further elevating the quality and breadth of services the company delivers to its customers. In addition, he is focused on defining and leading the long-term strategy and vision for MTNs suite of solutions and market expansion, as well as fostering relationships with existing MTN customers. Mr. Beaumont is the President of EMEAA (Europe, Middle East, Africa and Asia) of SkyWare Global. Steve has over 25 years experience as an energetic, focused executive in technology, media, telecommunications, consumer goods and manufacturing, and has worked with some of the worlds most distinguished companies, including the UKs BBC, ITV, BBSat, Spains Telefonica, Globecast, Gillette, and Parker Pen. Steve has most recently worked for EMC UK, where he served as an Executive-in-Residence focused on turnarounds and business development. The past few years have proved challenging for many companies across diverse industries and regions around the world. Despite tough economic times, the global satellite market continued growing. According to the Satellite Industry Association (SIA) data the satellite market has experienced an average annual growth of 11.2 percent from 2005-2010. The growing demand for satellite capacity is driven by many factors, some of which include the need for faster speeds and larger bandwidths, Internet across developing and geographically challenged countries, real-time communications anywhere-anytime and remote communications for military and government. Robert Bell has more than 20 years experience in the telecommunications industry and is currently Executive Director of the World Teleport Association (WTA). Robert spoke at NewSats Satellite Seminar held at its South Australian Teleport in late 2011 and provided some in-depth insights into the global satellite industry, presenting four predictions for the future of satellite communications. Mr. Bell believes that satellite communications is a growing global market that offers many opportunities and niches. This is a result of an ever increasing demand for high-quality bandwidth communications via satellite across a wide range of industries. Only a matter of weeks later, on January 25, 2012, AMOS-5 entered commercial operations with all systems go. Located at the 17 degrees E orbital position, it is a powerful platform offering a pan-African C-band beam alongside three Ku-band regional beams. The satellites fixed pan-African C-band beam and three steerable Ku-band beams cover Africa with connectivity to Europe and the Middle East and support multiple transponders in both C-band and Ku-band. Thus AMOS-5 is an attractive source of capacity for a variety of African and African-related businesses, including telcos, cellular operators, teleports, enterprises, broadcasters, governments and others. Interorbital Systems (IOS) of Mojave, California, entered 2012 armed with the notification of its selection for a NASA SBIR Phase I award supporting the continued development of the companys NEPTUNE modular rocket system. The NEPTUNE family of rockets is based on a single common building block: a stand-alone rocket that can be bundled in varying numbers with other identical modulesCommon Propulsion Modules or CPMsto meet any mission requirement.